Welcome! Have you linked up to this weeks Back For Seconds Social? Come join the party here! Samoas are my favorite Girl Scout cookie. What's not to love about chocolate, caramel, and coconut? I wanted to recreate this beloved cookie, but it seemed a little too time consuming to make those cute little round cookies with the cut out in the middle - I am a busy girl, after all. So I changed it up a bit and made them into bars! 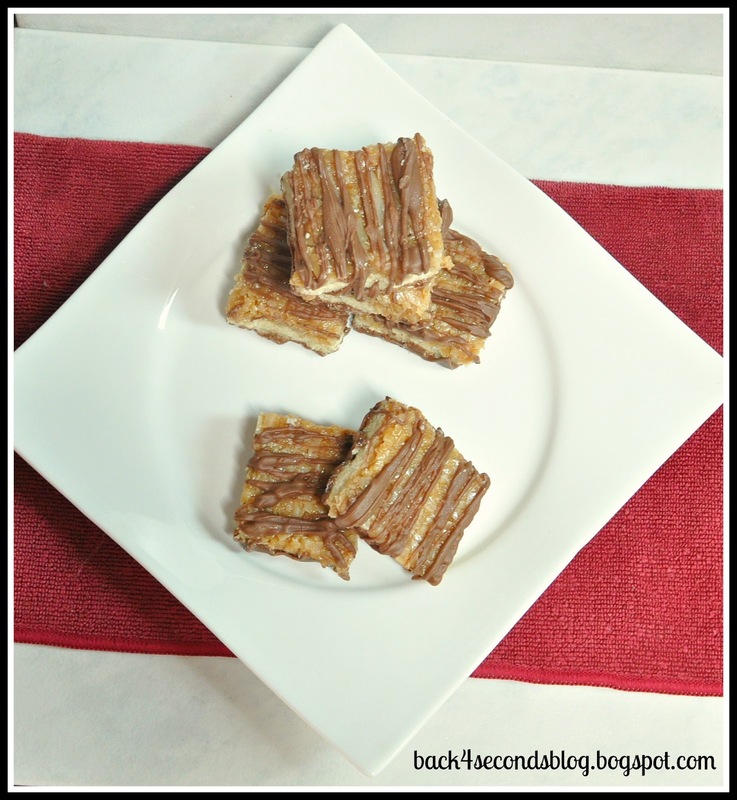 They may not be the fanciest dessert, but I love a good bar recipe! They are so much faster to make and equally delicious as any cute little cut outs. I actually made these several months ago, but life got in the way and I forgot to share them with you! Better late than never, right? These are so good, you guys. Buttery shortbread cookie crust. Toasted coconut and gooey caramel topping. Dunked and drizzled with chocolate. Amen. In a large bowl cream together the butter and sugar. Add in the egg, vanilla, and salt and mix until well combined. Slowly add in the flour mixing until incorporated. Press dough into greased 9x13" pan and bake for 22-25 minutes. Let cool. Melt the caramel with the milk over medium/low heat stirring frequently until smooth. Stir in the toasted coconut and spread over cookie crust. Chill for at least 30 minutes and cut into squares. Samoas are my favorite! I love this bar version! Eeeeek! These look so so so good. I love Samoas! How is it possible that they're one of the best cookies ever? Seriously. 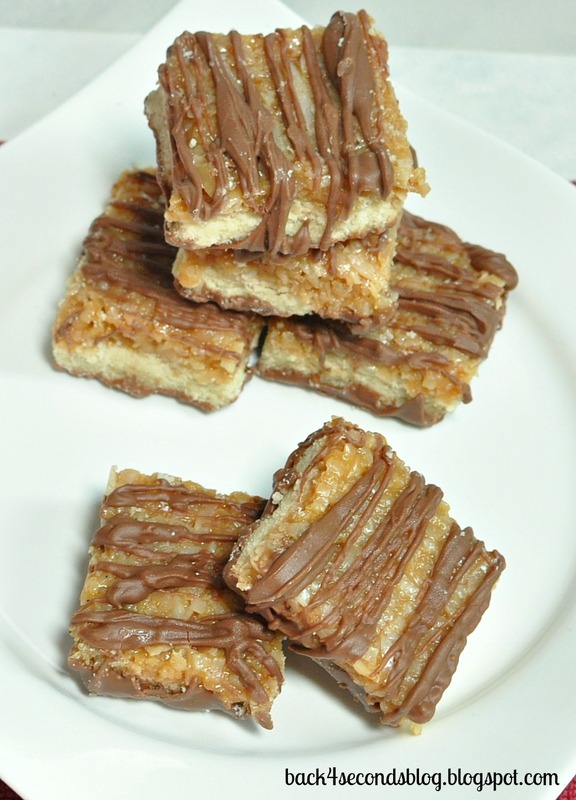 These bars look so gooey and totally yummy. Between these bars and Hayley's cheesecakes today, I am craving my favorite girl scout cookie! And I secretly like my cookies in bar form better - thicker and MUCH easier to bake in the kitchen! Bars are even better! I looove Samoas. I only allow myself to buy a few boxes in the spring or I'll eat them all! these look wonderful! 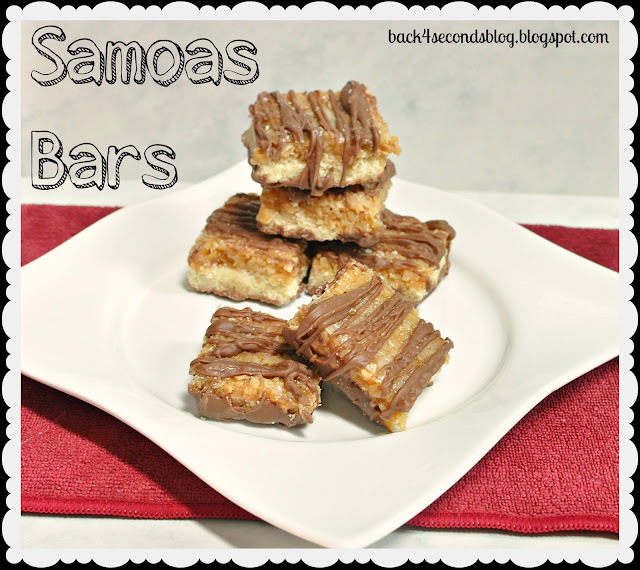 samoas are one of my favorite cookies, but i bet these taste even better! I love samoas! These look great. Samoas are my favorite. These look amazingly yummy! These look so yummy! I love making bars so I'll definitely be trying these. Have a lovely weekend! Oh my these look so yummy! Thanks for sharing! You know the key to my heart-Samoas!! The best Girl Scout cookie ever!!! I like that you turned them into bars, much easier! Can't wait to try these! Yum! What a great idea. Absolutely love it if you could link up this (and a couple other recipes) to Wonderful Food Wednesday at http://www.athometake2.com.